We had the pleasure of collaborating with Milk & Honey to bring you two different styled looks with the same adorable charcoal coat. We both wanted to wear it so we thought this was a great opportunity to show you how it can be worn in multiple ways! Read below on how we styled it in our unique way and the link to add this to your own wardrobe for less. 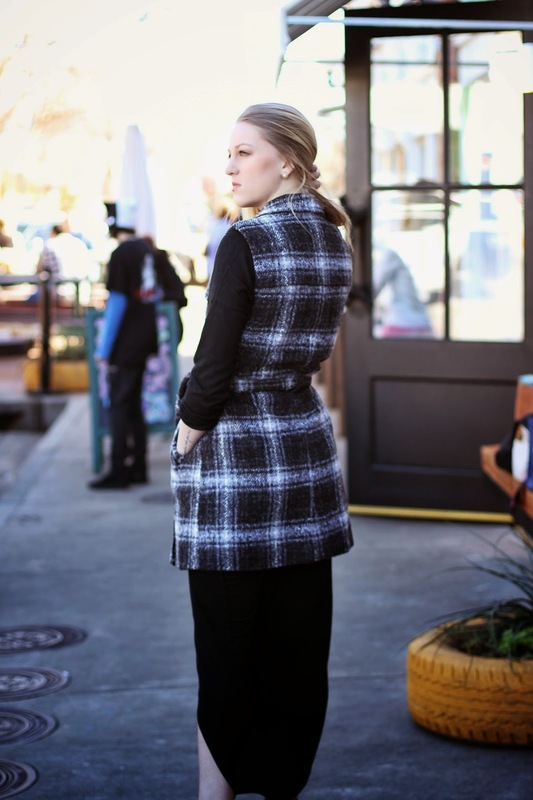 When I first saw this charcoal coat from Milk & Honey, I had a few different ideas on how to style it. I knew I definitely wanted to wear a long sleeve under it but wasn't sure if I would do a skirt or pants. Ultimately I decided to go with my tried and true: JEANS. I love how the lighter wash on these Rag & Bone jeans (currently ON SALE - shop below) really stands out against the dark gray plaid. As I've mentioned in previous posts, I am currently obsessed with mixing grays so this vest was the perfect opportunity to do that! I chose to keep it simple with a basic long sleeve tee, heel booties, a rabbit fur infinity scarf and jewelry – all in gray. What I love about this piece is that it not only feeds my gray obsession but also my love of vests and trench coats ALL IN ONE. It's also a really great length because it pairs well over skinny jeans or leggings but is also long enough to be worn with a short skirt or dress. This chic coat is a great outerwear option for typical Texas weather when there's a bit of a chill in the morning but the sun warms the afternoon right up and you don't want to be stuck wearing a heavy or bulky coat. Overall, I love the versatility and uniqueness it brings to a variety of different outfits! When it comes to Texas weather, there is a good chance the day will start out at 65 degrees, rise to 80, then drop to 40 with drizzle all within a 15 hour time-span. While we transition to Spring, it's great to have a few versatile pieces that can easily be worn while the seasons change. 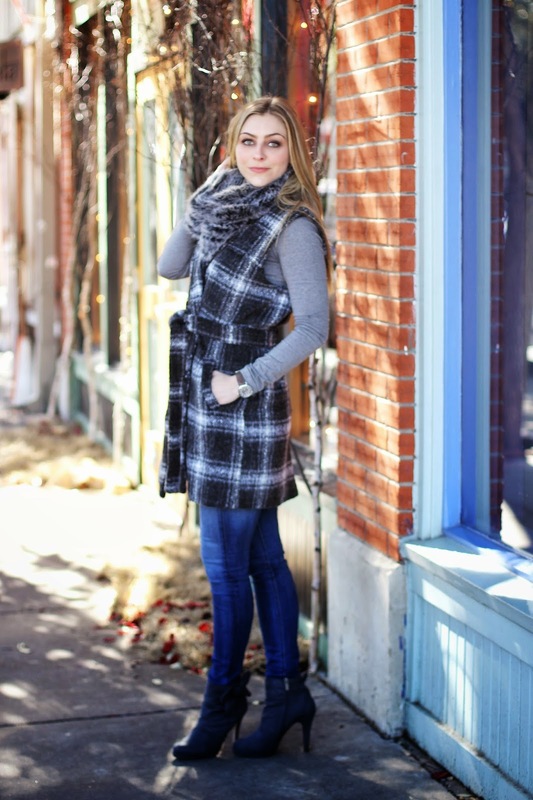 This charcoal plaid coat is just that! A great layering accessory that will do the job of keeping you warm and weather appropriate without being overbearing. 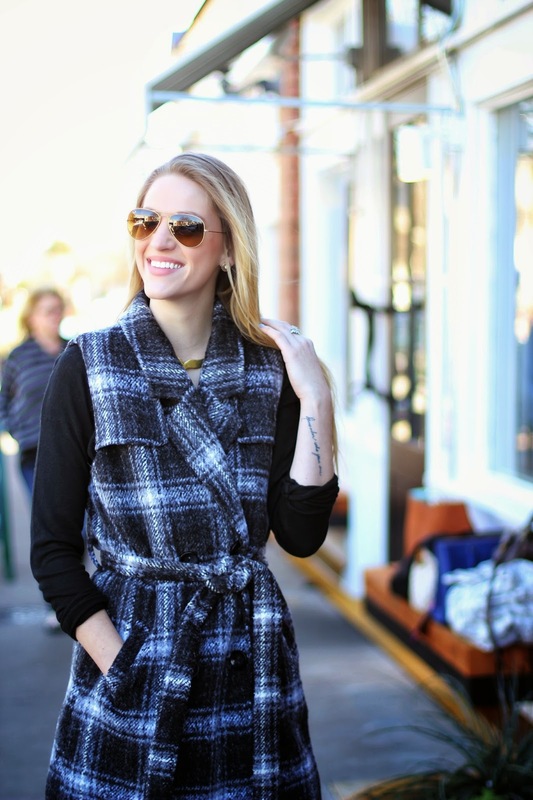 I chose to style this plaid coat with a simple black sweater and high-low skirt from Target. Something about this look is simple and elegant. I'm a no-fuss fashion girl so the simpler the better. This coat gave my day wear black-on-black look something extra with the texture, lack of sleeves and my favorite, pockets! Not only is this piece a great add to transition into a new season but a great piece to help an outfit go from day to night. Lucky for you, it's on SALE at Milk & Honey online. Click the link below to add this adorable coat to your wardrobe.